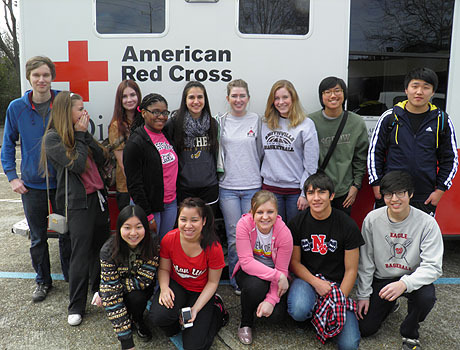 Exchange students in Mississippi volunteered for the American Red Cross. My wife Sissy and I have hosted 14 foreign exchange students at our home. In addition to serving as host parents, I am an American Red Cross volunteer in the area of Disaster Services and operate the Emergency Response Vehicle (ERV). Since the American Red Cross is part of the world's largest volunteer network found in 187 countries, I thought why not collaborate with a group of foreign exchange students and a day of volunteering? Students from various countries joined together February 22 to check supplies and water freshness dates, take inventory on cots and blankets, and clean and restock two ERVs and a pick-up truck as part of disaster preparedness for the Northeast Mississippi Chapter office. Some of the students had never participated in such a project and others were just vaguely familiar with what was taking place. But they all worked together and fully accomplished their mission in cooperation with good work ethic, some fun, and of course, pizza! Many of the students said they were unfamiliar with the idea of volunteering, or with an organization that performed these duties through volunteering in their country. It also showed them that with people of various backgrounds, talents, and skill levels, all were important and all were valuable.